3. Quick Selection Tool, Magic Wand Tool. Let me try to explain few of the tools mentioned above. This tool is usually used to select an area of an image that is rectangular in shape.Area with square shape can be selected by holding down the shift key and drag to create a square selection. 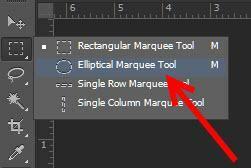 Elliptical Marquee Tool: This tool is used to select an area in the image that has elliptical shape. To select an area with circular shape in the image hold the shift and drag to create a circular selection. Lasso Tool: The lasso tool allows for free form of selection on the image . Magic Wand Tool: The magic wand allows one to select a consistently colored area without having to trace the outline.The the selected color range is specified relative to the original color clicked.